Sometimes the holidays make me sad. It’s the time of year for great expectations and festive gatherings. There is subtle pressure to be joyful and happy. Or so it seems. Memories of holidays past tend to flood my thoughts and I can feel as though I’m walking through honey. Just when I need my energy to surge, it fails me. Though it’s important to accept and honor my thoughts and feelings, I view them as temporary. Thus I find myself longing for an opening of the unbound heart. Enter the vintage silver gown and the discipline of blogging. How could my spirits not be lifted by the swirl of its skirt and the drape of its graceful folds which cascade and embrace. This silver beauty is one of the queens of my gown collection, and it usually graces the holidays with its presence. My rhinestone collection has been active this season, and several pieces make an appearance on this post. After all, this vintage white felt headpiece trimmed with satin is embellished with a rhinestone pin. Why not mirror its sparkle and allow more glimmering treasures to share the limelight! Long white leather vintage opera gloves add the finishing touch, along with silver heeled pumps, which show their pointy toes beneath the silver gown’s abundant hemline. I never underestimate the power of style to alter the neurons in my brain, and flip my mood from melancholy to a state of playful amusement. However, without the factor of the fervent desire to continue to blog and to create, I may not have had the motivation to peruse my closets and discover once again the magic of the silver gown. 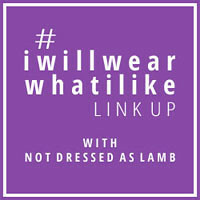 Linking up with Catherine’s #iwillwearwhatilike HERE at Not Dressed As Lamb and Cherie’s Shoe and Tell Fashion Link Up HERE at Style Nudge. that’s there too…be with it all on this shortest day! It’s true that the memories of times past can make us sad, but I’ve been trying so hard to be positive about life and what it’s given to me. Your beauty always shines through your outfits and words, Judith!! Judith, such a thoughtful and inspiring message. I too find the holidays to be a sometimes stressful time filled with pressure to always be joyful and happy, making it difficult to measure up to the, mostly, commercial expectations. Your words help to put that into perspective and your sharing helps to remind us that there are a myriad of emotions that we have and that others might be having as well. Wishing you and Jeff a satisfying and peaceful season. We won’t be out to Denver this year, but look forward to connecting again in the future. I find New Year’s Eve bittersweet, not for any particular reason, just that we never know what the coming year will hold for us. It also marks the passing of another year, and time seems to pass more quickly the older I get – my mum warned me this would happen! Mum knows best right?! I am looking forward to seeing more of your amazing style in 2018 Judith! I love your beautiful silver dress. Wishing you a very Merry Christmas and a Happy New Year! I agree that making the effort to “dress up and show up” can be a real mood lifter. And that gown…just divine!!! You look like a Winter Goddess. That Gown is Beautiful, and you make it even More So!! I’m almost jealous… You look like a Silver Snowflake!! Beautiful Everything, especially your Beautiful Spirit. Merriest Christmas, Happiest New Year, May All Joy wrap around You and all those you Love. I share your feelings of melancholy at this time of year…and the forced suggestion that it’s the best season for some reason. Then there’s the pressure to “find the perfect gifts”. The gown is absolutely gorgeous and I hope you have many places to wear it. It looks beautiful on you. I agree that as I age, the honey gets thicker. Always appreciate receiving your blog updates. I love your embodiment of women’s power. Our generation has seen, survived, and thrived through incredible change. Thank you. Gaspingly beautiful. The photos Daniel took, the gown outfit, and the way you add to the shine. Uplifting. You have described so well similar feelings that I have. I count on the discipline of blogging to keep me on track, but there are times when I’m moving through honey as well. I’m usually relieved that my closet is only an arm’s reach away. I sense an unusual joie de vivre downtown during these holiday days. I wonder if it’s just my senses shorting out or a real thing. No matter, it is like drinking hot chocolate. Thank you, Judith, and Daniel. Have a warm holiday. Stunning and, oh, so elegant. judith, you and your thoughts are beautiful! thank you for sharing and continuing to blog. I think this season holds very high expectations for many and often people feel the total opposite. I’m happy your wonderful collection of clothes inspired you to push past the melancholy. You look lovely as ever. Wishing for you all the happiness your heart can hold in the New Year. Winter goddess indeed. Such an uplifting experience to read and see your posts. This year, and every year. Welcome Yule” (slight adapted from Susan Cooper’s the Shortest Day). I love this gown, and I love your words. I agree about honoring our feelings – and I love the add-on of knowing they are temporary. We know that, but it’s good to see it added at the get-go. I had to learn about honoring my feelings, when most people didn’t have a clue about what I was going through. Merry Christmas to you, Judith. I think you are lovely and I enjoy reading your blog. Thank you for the time and effort it takes to prepare the blog for your readers. The drap of that gorgeous gown has me swooning, as it was designed to do! It is the perfect gown to grace such an occasion as Christmas. The photographs are absolutely magical. Happy thoughts are my wish for you as you go down Memory Lane. Never a word more truly written, Judith. Wading through treacle is how I describe surviving the Xmas season, it’s not my favourite time of year but knowing I can escape to India in a couple of weeks makes it a whole lot more bearable. That dress is a triumph, it fits like a glove and makes you look like a fairytale ice queen. Gorgeous. You are, as per usual, absolutely stunning in the silver gown which you purchased from me several years ago. Thanks for your honesty and for sharing what a lot of us experience during these short and dark days of the year. Such a bittersweet time as we remember those whom have left us with our sweet memories of past holidays coupled with our endeavor to savor the present with our special moments with our families and friends and to celebrate how full and blessed we truly are. We can always rely on you for honesty, and this post touches on the truth of the biggest of holidays and how challenging it can be for some. I tend to go through the motions and hope that the family traditions and rituals will imbue me with the necessary joy for the occasion. Your silver gown is divine, and you channel some true Hollywood glamour in these shots. All the accessories add to that sparkling look making for a stunning shoot. Well done to Daniel for capturing your ethereal magic once again. Wishing you a very Happy Christmas and a peaceful New Year. The silver gown is stunning but I also enjoy your vintage hat collections. I enjoy your blog and your stylish looks! Lovely and touching post. The days I seem to work the hardest at dressing is the days I feel the lowest. Once I get through the process I always feel better but some days it can be quite daunting! Happy holidays lovely lady! Judith, You express yourself so beautifully both in words and fashion. It keeps your blog so interesting, inspirational, and real as you express your honest feelings. I have been following your blog for many years now and know of the losses and heartaches you have suffered. What can I say but that it is part and parcel of the human condition. You are a truly beautiful woman, inside and out, and your incredible style and writings have delighted and uplifted so many. Thank you dear Judith and the best wishes for a wonderful holiday season to you and your family. Younever disappoint. Ost of the times you have me in awe. Like today. My goodness woman, you are an epiphany. Very appropriate this time of year. Soooo elegant. I am swooning over you. I can list the things I love, but can make it simple: everything. Merry Christmas dear Judith. I will follow you for as long as you blog. Keep it up please. The holidays can be a sad time for many people, and it makes it worse when the expectation is to be cheerful and merry. I find that not putting any pressure on myself to socialize or be “festive” if I don’t feel like it has made it easier. I love that first photo of you with the gown swirling around you – the magic of the beautiful swirly skirt would be enough to make me smile. Wishing you peace, love and joy in the new year.